It was recently brought to my attention that a short I saw waaaay back in 2011 at the now defunct Worldwide Shorts Festival is now online via Alter. Check out Dan Gitsham's Ella starring Anthony Head below. I dig this short and its unique take on Red Riding Hood. Gitsham must have had a crystal ball because he beat the whole “people in animal masks” trend by at least a year. He recently returned to short filmmaking last year with And The Baby Screamed. 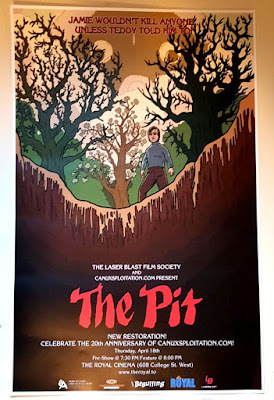 Last Thursday, in celebration of the 20th anniversary of the indispensable film archive Canuxpliotation.com, the Laser Blast Film Society screened the 1981 Canadian classic The Pit at The Royal. 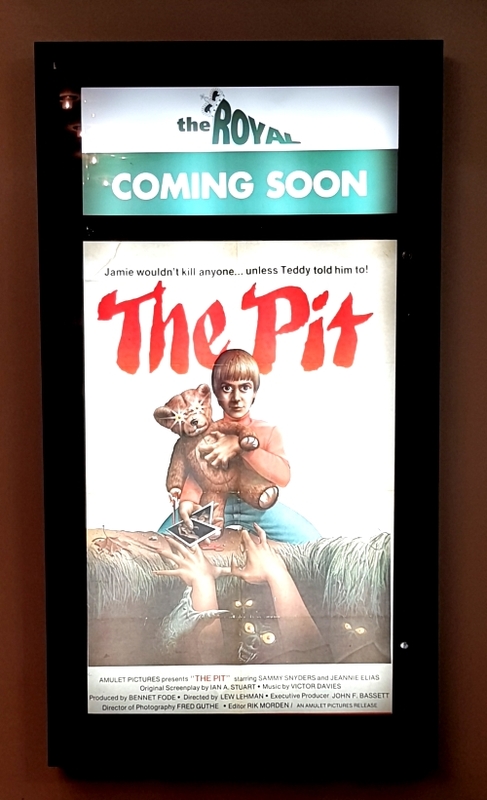 My love of this film is no secret and I was super chuffed to see it on the big screen. Fortunately, there were others with artistic skills just as excited and they fashioned stuff for the event. It was a terrific night of wacko Canadian film appreciation. 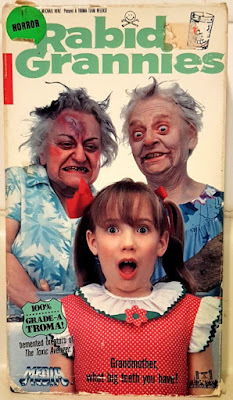 This week's VHS is a recent acquisition in Emmanuel Kervyn's 1988 horror Rabid Grannies. A birthday party for two old ladies (Catherine Ayemerie & Caroline Braeckman) turns gruesome when they are possessed by demons and start knocking off their greedy relatives. Rabid Grannies was a strange beast because it was a four European country co-production that was released this side of the pond by Troma Entertainment. It was a good fit for them, as the subject matter screams the company that brought us titles like The Toxic Avenger and Surf Nazis Must Die. However, with the foreign locales, dubbed dialogue and over-the-top gore, the hybrid actually felt more along the lines of Lamberto Bava or Braindead-era Peter Jackson. It is amusing to note that a more appropriate title would've been Demonic Grannies, as the two grand matriarchs were possessed by a evil artifact given to them by a shunned relative and not infected by a four-legged creature. I'm guessing, in a practice that was popular in the eighties, this movie started as a title (or poster art) and worked its way back from that. Rabid Grannies takes an unusually long time setting up its characters. That's not to say there's anything deep about them, there's just a large number so it just took a good chunk of time introducing them all. You've got the unhappy couple with kids, the magnate with the trophy wife, the bad boy and the lesbian couple for which I wonder if the filmmakers were trying to be progressive or exploitative. My money's on the latter. It was over a half-hour before the gore started flying, but it was very entertaining once it did.. I must admit there was a good deal of it, much more than I would've expected. I imagine that is why – save the catchy title – Rabid Grannies hasn't been forgotten. Everyone was fair game and most were cut to pieces. Even the ending was something that, again, echoed the younger Bava. You know, this could've been one of the umpteen Demons sequels and no one would have batted a gouged out eye. This was a good pickup for Troma, as it matched their mandate, but also branched them out from the urban American titles they were known for. I found this Inside Edition piece about one of the last video stores in America yesterday. It's always good to see people keeping the dream alive. Looks like they have a pretty good horror section too. This week I dug into the wonderful world of animation and pulled out Aram Sarkisian's short Winston from 2017. This was Sarkisian's final project at California Institute of the Arts. I love the Poe-like qualities of this piece as much as its distinctive art style. I look forward to seeing what comes next for this young talent. 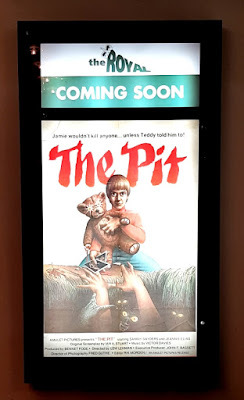 I guested on the newest episode of the podcast The Boys Who Would Be Critics where we discussed the new Pet Sematary movie, as well as some other fun King adaptations of yore. Check it out below if you feel so inclined. This week's flick is Larry Cohen's 1987 vampire flick A Return to Salem's Lot. An anthropologist (Michael Moriarty) and his son (Ricky Reed) visit an quiet Maine town not realizing it is populated by vampires. I've been watching a lot of old Stephen King movie adaptations lately in preparation for a podcast I'm sitting in on this weekend. 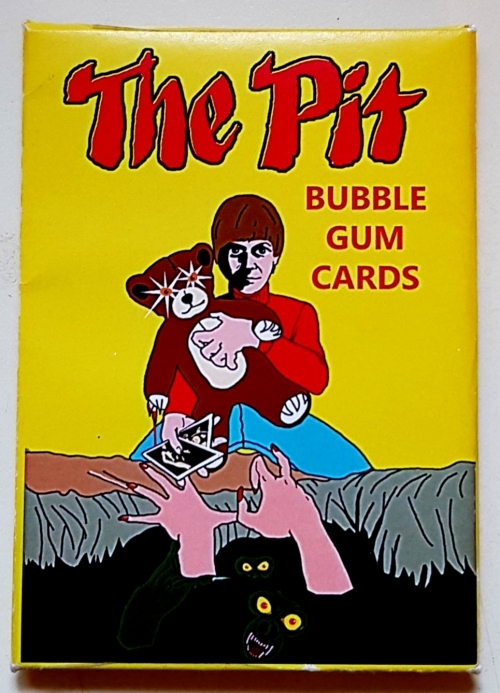 I'd never seen the Tobe Hooper-helmed teleplay either so I had to seek that out, as well. That's almost five hours of Salem's Lot and I was pretty happy with the ride. 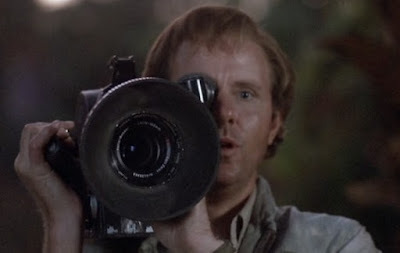 Michael Moriarty in A Return to Salem's Lot. As one might expect, the differences between the two iterations are vast. Hooper's take was a TV miniseries and though it would've been revolutionary in 1979, it's pretty tame by today's standards. I did chuckle at the nods to Texas Chainsaw and that scene where Danny (Brad Savage) was floating outside his brother's window was creepy as hell. There's so much of it that oozed into the vampire films of the next decade like The Lost Boys and Fright Night. I also couldn't help but think of Evil Dead while watching that aforementioned scene, as well. Anyway, moving onto A Return to Salem's Lot, it was Cohen through and through, especially due to the presence of regular collaborator Michael Moriarty. Some things just go together. Peanut butter and jam. Rye and ginger. And Cohen and Moriarty. Apparently, this was shot back-to-back with It's Alive III so everything worked out well, didn't it? Anchored by Moriarty, Return has everything else you would expect from a Cohen joint, including foul-mouthed children, quirky characters (including a Nazi hunter played by famed director Sam Fuller) and random creature effects. It also didn't hurt Cohen had the immeasurable talents of cinematographer Daniel Pearl – who coincidentally also shot Hooper's 1974 masterpiece – at his disposal. 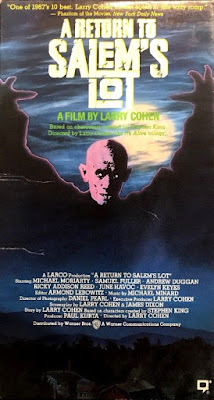 Return's script was written by Cohen himself and though it has no real connection to King's work whatsoever – Barlow does not even appear in the movie despite the cover box – it did present some interesting story threads, most intriguingly the idea of the vampires wanting their existence to be documented by Moriarty's character. 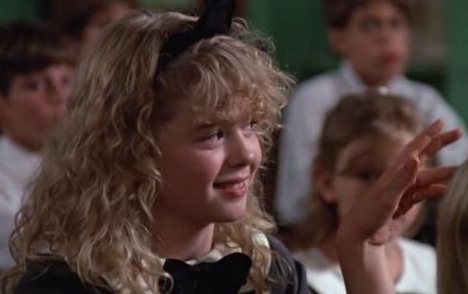 It also took me a few scenes to recognize a super young Tara Reid in her first role. Tara Reid in A Return to Salem's Lot. I still regard Cohen's New York stories to be his best works, but A Return to Salem's Lot was still an entertaining venture made just before he shifted his focus to screenwriting. With the release of Pet Sematary last weekend, it made sense to post this similarly-themed short from 2017 called The Dollmaker directed by Al Lougher. The Dollmaker just launched via the online horror channel Alter, so be sure to check that out for more horror content. 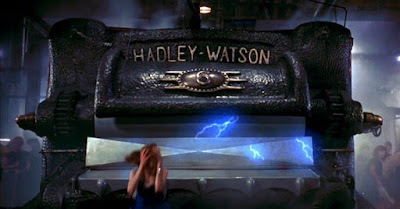 With the latest iteration of Pet Sematary in theatres, I decided to watch an old Stephen King ditty I'd been meaning to revisit, Tobe Hooper's The Mangler from 1995. After several fatalities involving an old laundry pressing machine, grizzled cop Hunton (Ted Levine) begins to suspect it may be possessed by evil. I watched this when it came out in theatres and remembered liking it, but oh my did this not hold up as well as I thought it might. 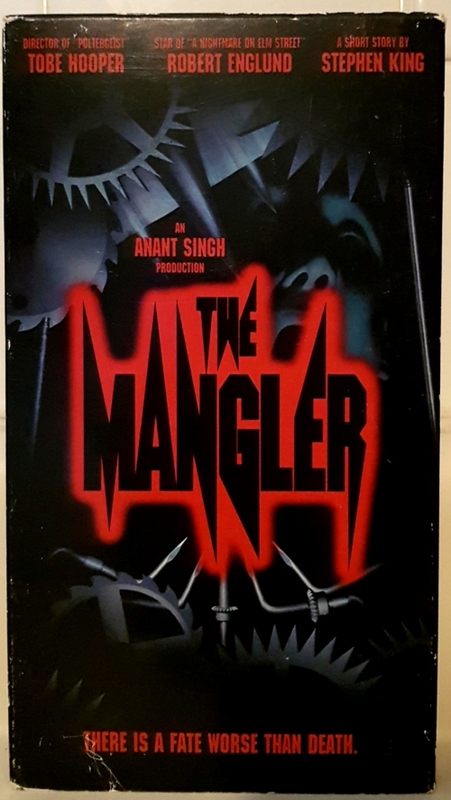 First off, just from the title graphic alone, The Mangler had direct-to-video written all over it. It's amazing some of the horror movies that got a wide release back in the nineties, but, to be fair, the trio of King, Hooper & Robert Englund does carry a large amount of cache. And considering it was largely shot in South Africa, I can't imagine it cost a lot to make either. But I digress. 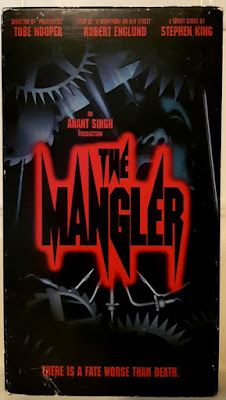 Perhaps not surprisingly, the most striking thing about this movie was The Mangler itself. Apparently designed by Hooper's own son, William, it's a truly menacing piece of machinery, right down to the sound design. It's also fortunate that the movie at least delivered on its promise of crushing and folding more than a few people like so much laundry. I was little sad that the icebox scene was not nearly as outrageous as I remembered it. Dang recall! Everything aside from the machine eating people was kind of a mess... Okay, a different kind of mess. I remembered Englund's performance as the machine's owner being a tad cartoonish, but holy mothballs! 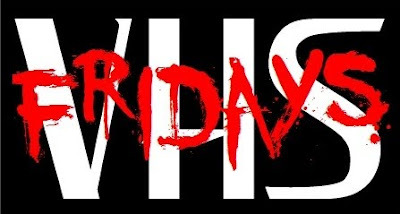 I feel like Englund asked Hooper on day one, “so how far do you want me to take this?” and he was like, “take Lefty & Chop Top from Texas 2 and crank it to eleven”. To be honest though, apart from the occasional off-kilter camera angle, I felt there was a lack of direction from Hooper, most apparent during the meandering exchanges between Hunton and his worldly brother-in-law Mark (Daniel Matmor). It was like they were improving half of their scenes together with only an end point to guide them. It's bitter sweet because it made for some amusing moments (in a wow-what-is-going-on kind of way), but it's not the most concise way to make a movie. I had clearly blanked out the climax because I did not recall that it unfortunately goes the route of almost every King adaptation of the nineties, falling back on instantly regrettable visual effects. Mercifully, they were kept to a minimum with the use of shadow and quick cuts though. The Mangler came at the tail end of an era that saw King properties appear at an almost monthly pace and though it's by no means the worst, it was far from its well-oiled namesake. As I patiently await the release date of the Alita Blu-ray, I was reminded of a fantastic proof-of-concept short film that hit the Web a few years ago. Here below is Henrik Bjerregaard Clausen's super ambitious short, Arene from 2016. Sadly, it doesn't look like anything more came out of this - though Clausen has since directed two more shorts - but it is definitely cool regardless.